Basically I am a big dosa lover and love to try dosa varieties at home.I make them mostly for breakfast. But I couldn’t share all of them in my blog as I don’t get time to click the pictures in the busy morning hours.Today Sendhil is working from home.So I prepared this mixed vegetable uthappam for his breakfast and clicked it too. 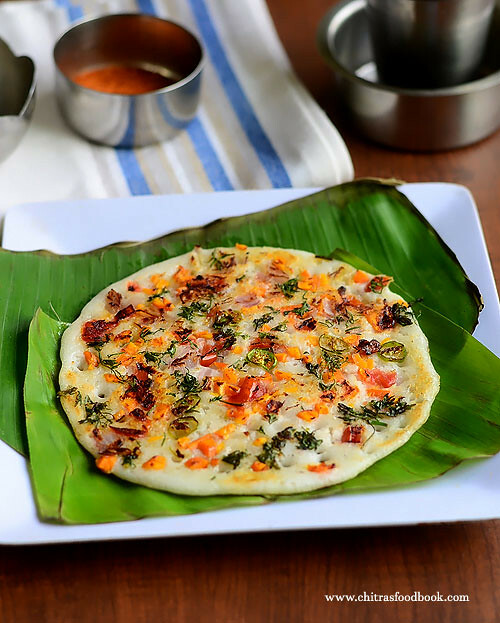 Onion uttapam and vegetable uthappam are our favorite among all the uthappam recipes in restaurant. So most of the time, this would be in our daily routine menu. More than the restaurant ones, I love this dosa version from small road side dosa corner. I have tasted and seen the making of mixed vegetable dosa several times in road side 101 dosa varieties stalls in Salem and Bangalore as well. Topped with the mixture of colorful, finely chopped vegetables & with lot of butter, this dosa tastes awesome with a watery coconut chutney, spicy Kara chutney and sambar served as a side dish. Literally I am drooling while writing this post and feel like running to a nearby dosa stall. At home, we can make a low calorie version by using less oil/butter and more healthy by adding more quantity of vegetables than hotels.Do try this for breakfast & kids lunch box. They would love to eat this colorful dosa. Sprinkle some cheese & make it more attractive for kids. 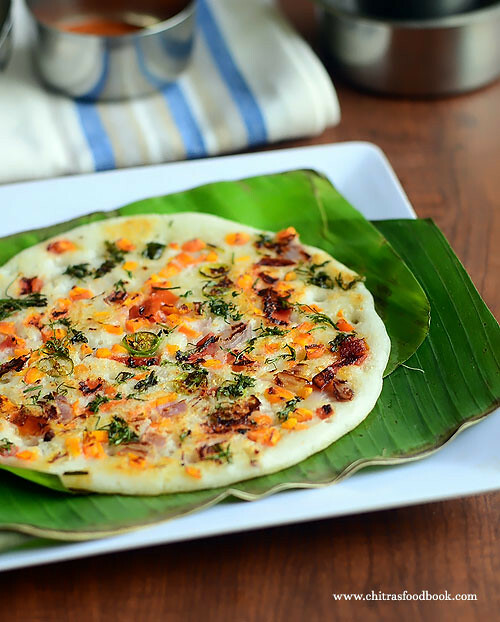 Lets see how to make this yummy vegetable uthappam recipe with step by step photos. How to make mixed vegetable uttapam - Healthy dosa varieties for breakfast/dinner ! Check out my MIXIE DOSA BATTER recipe too. Wash and finely chop the carrot, onion, tomato, green chillies, capsicum and coriander leaves and mix everything together.Instead of fine chopping you can grate carrot.If you like ginger flavor, add a tsp of grated ginger. In addition to this vegetables, you can add finely chopped cabbage, beans if you like.Heat a dosa tawa and pour a ladleful of dosa batter. Spread it slightly and make thick dosa if making uthappam. If you want to make as a dosa, spread more. As soon as you see some holes on the top of the dosa, start sprinkling the mixed vegetables all over the dosa. Drizzle 2 tsp of oil around it. By this time, the bottom portion of dosa would have cooked. Flip the dosa, press it lightly with the dosa flipper and cook the dosa in medium flame for 2-3 minutes. For variations cover and cook the dosa without flipping it.Add little more oil if needed.Remove the dosa and serve hot with chutney, sambar. 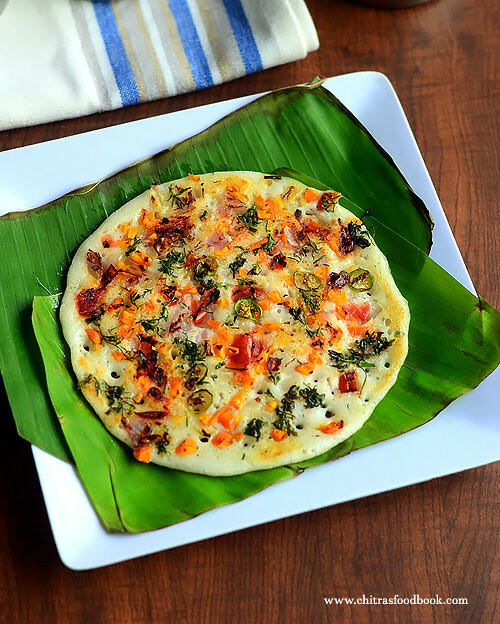 Make this colorful, healthy vegetable uthappam at home and enjoy ! Thanks for the suggestion Mahi. Have updated the post with these points :) Thanks again !